Pearl partnered with ButtKicker to develop a "low-end feel machine" that attaches directly under any throne. 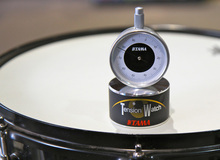 Evans announces the new System Blue Marching Tenor Heads with Sound Shaping Technology. Turning Point hardware is designed to get rid of wing nuts by introducing a spring-loaded, tilting mechanism called a swing nut. The Drumset Pre-Pack from Cymbag includes one 20˝, one 16˝ and two 14˝ Cymbags in a reusable, recyclable cloth carrying case. Los Cabos Drumsticks have redesigned and expanded their line of practice pads.